Ford Aerospace have recently invested in CATIA V6 software. This innovative CATIA technology gives the company the ability to accept and manage information digitally transferred from customers who also have the software to co-ordinate a digital data transfer. This cutting edge investment enables the company to deliver best in class products and solutions, simulate and optimize machining and inspection capabilities ensuring a first class method of manufacture. As well as having the CATIA software, the companies’ engineering department must have up to date technology in the form of CAD/CAM design software, this is to enable our engineers to create programs and drawings from customer drawings and specifications. Ford have annually updated the CAD/CAM software that we use keeping up to date with the newest versions of both Solidworks and Alphacam. Ford Aerospace are currently using Solidworks 2016 as our CAD software. This software enables our manufacturing engineers to produce accurate 3D part models from a paper drawing that has been sent to us by a customer. The software is capable of being able to import a range of different file types and this enables us to produce our own drawings from customer models. Integrated into this software is the ability to evaluate and test parts properties before they have been manufactured, this means that the parts can have the shear stress and other forces calculated when a material has been assigned to the part. We are currently using Alphacam 2016 R1 as our CAM software. This software primarily enables our manufacturing engineers to produce programs for the shop floor CNC machines. The software is capable of producing programs from either the 3D Solid works models or just by creating manual tool paths however this may take significantly longer on complex parts. This software is our main programming software which is used to program the CNC Milling machines in our factory. 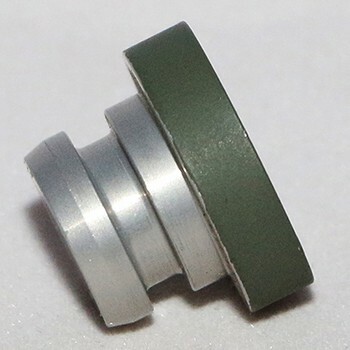 This shim, like many others which we produce, will be manufactured in the CNC milling section. The program for this part will be designed on the latest CAD/CAM software offline, before being transferred to the milling machine to be manufactured in one operation, reducing the need for multiple setups, saving time and allowing lead times to be reduced for the customer. 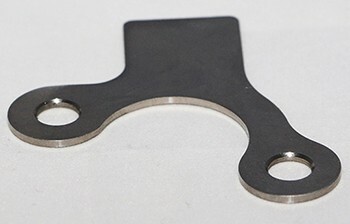 This Bracket is an example of a complex part which we produce in house within the CNC milling section. 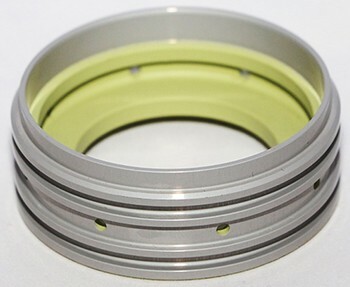 It is manufactured on a five-axis machine in order to cut the number of operations, allowing the manufacturing time to be reduced, which reduces the lead time for the customer. This housing is a component which Ford Aerospace will be producing in large quantities in the future. In order to make this feasible, we have developed a lean manufacturing process which combines and reduces the number of operations required, allowing a more efficient work flow from start to finish. 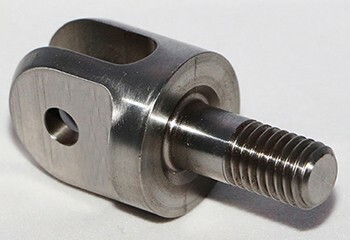 Our spacers are produced within the CNC turning section, being manufactured complete in one operation due to the machining capabilities that we have. Starting with a raw billet, we machine the part down to the required size and profile before drilling the external holes, all from one setup. 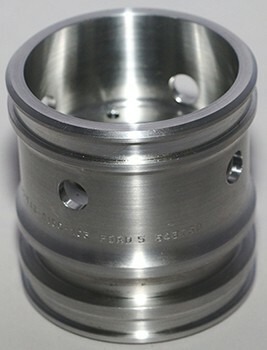 This Grease Distributor is produced within the CNC Turning section of Ford Aerospace and is one of the many parts which require the use of our programming software. 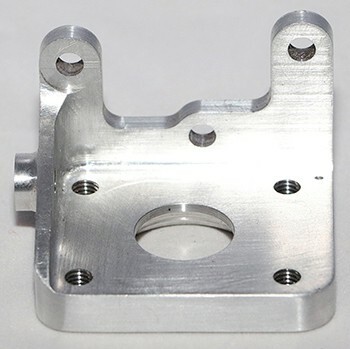 Although this may not seem like a complex component, its tolerances and requirements are such that it requires the use the CAM turning software within our CAD/CAM package, to ensure the final product meets the customer’s requirements. The Link is one of many vital parts we manufacture at Ford Aerospace. Being a vital part, the strict process from raw material purchase all the way to final dispatch is mutually agreed with the customer and followed exactly in accordance with their specifications. Ford’s capability is trusted by major OEMs to manufacture a range of flight-critical components. 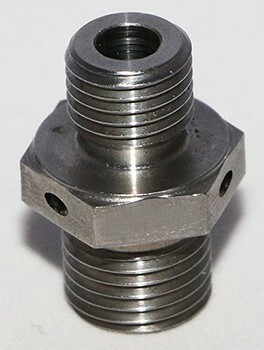 This End Cap is produced in the CNC milling section and is manufactured in two operations. The milling of the outer profile and the inner features form one operation, followed by the backing off of the part to the correct thickness. 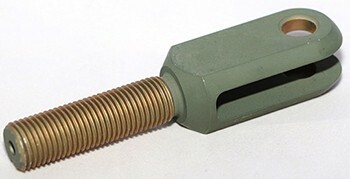 This component also received treatments at a subcontractor, as per the customer’s requirements and is painted upon return. This is one of the many parts which we produce in the CNC Turning section in high volumes and is one of the standard parts that we can offer to our customers, once a price plan has been agreed. The part will be turned from a raw bar, with the external profile being produced before being drilled and then parted off. Parts are then inspected to the customers’ requirements both before and after treatments, with either a sample or 100% inspection being carried out. 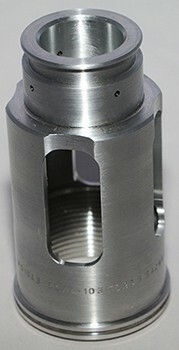 This housing bush was produced to the customer’s strict specification, which included dimensions with small tolerances, in order ensure that it would fulfil its purpose of joining two further components together. As the part would be visible when in use it was important to ensure that it was painted which would allow it to be aesthetically pleasing, but also to protect the item. 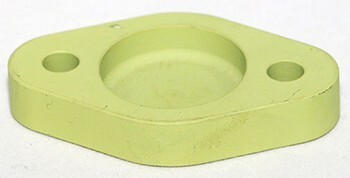 This precision machined locking plate is a part whose purpose is to join three other components together to form the final assembly. All dimensions must be accurate and within tolerance, as any slight deviation would cause complications, preventing the correct assembly from occurring, which would lead to the components being scrapped.